Nursing schools in Dallas, TX are amongst some of the very best in the nation. Many of the nursing programs in Dallas are well respected and able to provide nurses with the knowledge and skills they will need to excel at nursing after graduation. While there are numerous nursing schools in Dallas to choose from, it is extremely important that the nursing school a person selects is accredited. Graduating from a Dallas nursing school that is not accredited will make finding a job very difficult. Hospitals and health care organizations generally won’t hire individuals who have obtained degrees from unaccredited colleges, so individuals will need to keep this in mind when evaluating their education opportunities. Individuals that are seeking an Associate’s Nursing Degree, may want to consider schools in the Dallas County Community College District. These schools include: El Centro College, Brookhaven College, North Lake College and Mountain View College. Each of these schools offers an Associate in Applied Sciences (AAS) degree. Every one of them, with the exception of North Lake College and El Centro College, require that students complete 72 credit hours in four semesters or two years. Individuals will only need 71 credit hours to graduate from either North Lake College or El Centro College. To graduate from any of the aforementioned nursing schools in Dallas, individuals will be required to complete classroom work, labs and hospital clinicals. After completing a program, graduates should be prepared to sit for the National Council Licensure Examination for Registered Nurses. The Dallas Nursing Institute is another option for those seeking their Associate of Applied Science Degree in Nursing. This is an 80 week program. After successful completion of it, individuals will have earned their AAS Degree. This particular program has been approved by the Texas Board of Nursing. Students will be asked to complete classroom work, labs and clinicals. They will also be prepared to take the National Council Licensure Examination for Registered Nurses. Individuals who aren’t interested in a degree program but instead want to obtain a nursing certificate (LVN), will find that El Centro College offers a great certificate program. An LVN gives an individual the skills and credentials they need to work in a nursing home, hospital, doctor’s office or correctional institute. Dallas Nursing Institute also offers a LVN certificate program. It requires that students complete 51 credit hours just like the El Centro College program does. Individuals that have completed their LVN and want to obtain their AAS can do so via Dallas Nursing Institute’s transitional program. There are several Dallas Universities and nursing schools in Texas which offer nursing degree programs. Texas Christian University and the University of Texas at Arlington are two of the most well known. Texas Christian University’s Harris College of Nursing & Health Sciences is located in Fort Worth, Texas, right outside of Dallas. Both are accredited by the CCNE (Commission on Collegiate Nursing Education) and offer Bachelor, Master and Doctorate level programs. The University of Texas at Arlington has also been accredited by the CCNE. They are located in Arlington, Texas, a Dallas suburb and offer Bachelor, Master and Doctorate programs in nursing. 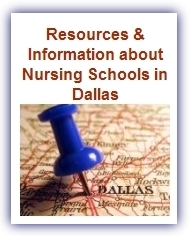 In closing, there are a number of excellent Dallas nursing schools to choose from. Prospective students will find that there are nursing schools in Dallas for every level of nursing, including LVN certification, Associates, Bachelors, Masters and Doctorate programs.